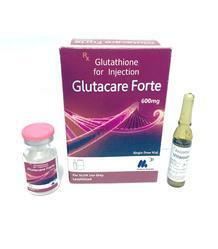 Providing you the best range of glutacare forte (reduced glutathione 1000mg tablet) and glutacare forte (glutathione 600mg injection & vitamin c) with effective & timely delivery. 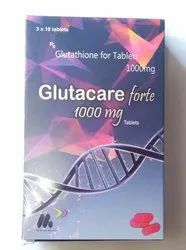 Glutacare Forte (L-Glutathione) is the most abundant intracellular thiol (sulfur-containing compound) and low molecular weight tripeptide found in living cells. Thiols such as glutathione, alpha lipoic acid and NAC are powerful sulfur-bearing antioxidants. The antioxidant functions of Glutathione Reduced include recycling vitamins E and C and serving as a critical nucleophilic scavenger, to block free radical damage to all types of tissues. Benefit: The primary use of glutathione is as an antioxidant. Support for the immune system and heart health are also significant benefits of glutathione. a) Antioxidant support: Glutacare Forte (Glutathione) may help support the body's ability to manage the oxidative stress of cells. It may also improve the activity of other antioxidants such as vitamins C & E.
b) Age Support: Glutacare Forte (Glutathione) may also help maintain various systems as you age, including the eyes and skin. c) Heart health support: Glutacare Forte (Glutathione) may help support a healthy cardiovascular system, especially with respect to healthy circulation and maintain a healthy cholesterol profile. d)Immune System Support: Adequate glutathione levels in the lymphoid cells help support the immune system to function at its best. Lymphoid cells produce antibodies that destroy cellular invaders such as bacteria and viruse. Glutathione and Vitamin C Antioxidants are commonly know to help in every health condition. In fact there are text books written claiming that oxidation is the cause of all health problems. Thus, giving antioxidants is an important treatment in many health conditions as well as healthy aging and sports performance. One of the main factors in taking antioxidants is making sure that you get them to the cells not just to your stomach. That is why injections of antioxidants is so effective. Injecting the antioxidants directly into the blood stream gets them to the site of need without the complications of going unharmed through the digestive system into the blood stream. The main antioxidants that we use in our injections are Vitamin C and Glutathione become very popular in many health conditions; cancer treatments, sports performance and recovery, cold and flu treatment and prevention, chronic fatigue and fibromyalgia to name a few. GLUTATHIONE is the main antioxidant of the liver. As the main antioxidant of the liver it helps in cleaning the blood and clearing toxins. It is also an antioxidant inside every cell and the intracellular level of glutathione predicts aging. Looking for Reduce Glutathione Tablet ?